Fill your mason jar about half way. Place lid on the jar securely and shake for one minute. Make sure to shake it good. Remove the lid and microwave. The lid is metal so make sure you don't put it in the microwave. 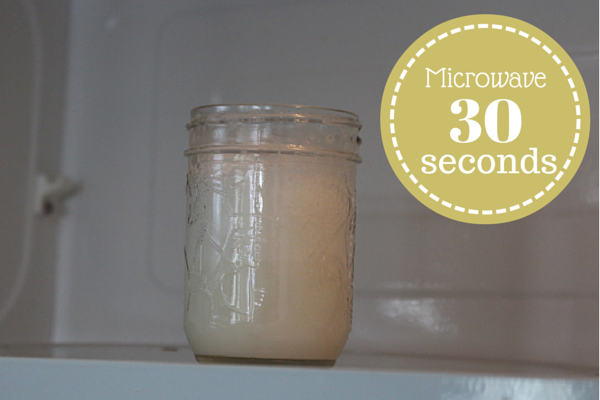 Microwave the mason jar for 30 seconds and make sure to watch it because the foam will rise and you don't want it to over flow. Now take your brewed coffee. I made an 8oz cup from my Keurig with Vanilla Caramel Creme coffee. Pour the warm milk into you coffee and spoon excess foam from the jar on the top of your latte.